Michael Smith made a winning start to his 2018 Premier League campaign last week with a 7-5 victory over Gary Anderson. Smith won six legs in a row from 5-1 down to secure the two points. The catalyst for Smith’s comeback last week was a 114 checkout to break the Anderson throw in the seventh leg of the match. Smith was also grateful that Anderson missed a combined total of 14 darts at doubles across three of the final six legs of their match. He brings confidence into this week having claimed a tournament victory in one of the three UK Open qualifiers last weekend. Smith notably defeated Michael van Gerwen 6-1 in the quarter-finals on his way to winning the event on Sunday. He had lost to Van Gerwen in the final of the Friday qualifier, while the Saturday qualifier didn’t end as well though as he was trounced 6-0 by Daryl Gurney in the last 32. Gurney was disappointed to eventually have had to settle for a point on his Premier League debut last week, where he saw a 6-3 lead pegged back by Raymond van Barneveld who won the final three legs of the match. He will certainly rue the three-missed darts at doubles which would have given him a 7-4 victory, as in total during the match Gurney squandered 11 darts at doubles in legs that he lost. Last weekend Gurney competed at the UK Open qualifiers; he had a run to the quarter-finals on Friday where he succumbed to Van Gerwen and on Saturday he defeated Michael Smith 6-0 on his way to reaching the last 16. The weekend ended with a disappointing first round defeat to Jeffrey de Zwaan in the third qualifier on the Sunday. Daryl Gurney enjoyed a 6-0 win over Michael Smith away from the TV stage in a UK Open qualifier at the weekend, and he is the bookmakers favourite to edge out Smith in his match. Smith shrugged off that defeat against Gurney with a tournament win on Sunday and should be very buoyant, especially as he took the prize scalp of Michael van Gerwen along the way, not to mention having also defeated Gary Anderson in the Premier League last Thursday. 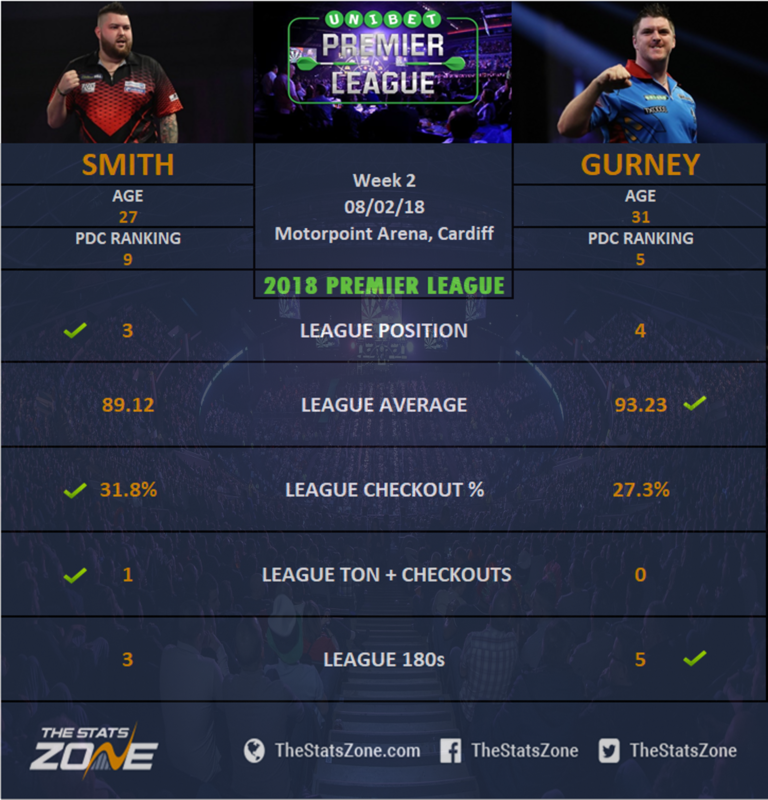 Smith does have an overall lead in their previous head-to-head encounters and has tasted success against Gurney in their only previous TV meeting, which came at the 2016 UK Open when he won 9-8. Expect this to be a lot closer than their encounter at the weekend; this has the potential to go all the way to a final leg and end in a draw which would see both players maintain their unbeaten start to the 2018 Premier League.